Are you looking for new ways to take your brand to the next level at a trade show or a marketing event? If you have attended or participated in trade shows before, you know that the competition is tough. To grab everyone’s attention is both expensive and time consuming. Some companies quickly become stale and outdated by reusing their marketing tactics and advertising equipment. As a result attendees might forget who you are or confuse you with other companies using the same tired tactics. Here are a few inexpensive and fun marketing techniques that will help you build your audience as well as attract more potential customers from competitors. To push your brand above the competition, everything in your booth must be eye-catching yet simple to understand. Make sure that the colors represent the company logo or theme and that all text is easy to read. Place your brand name and slogan in multiple places, so prospective customers understand exactly who are and what you do. 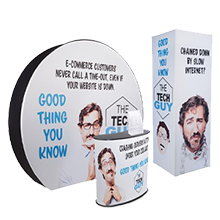 Many vendors and booth attendants purchase custom-printed backdrops and banners to grab more attention. Customized graphics will make your exhibit stall look more professional while creating a seamless presentation. Your branding space should always have its own personality. Exhibitors often have the opportunity to display their branding beyond the bounds of their booth. Considering sponsoring other event spaces like the venue's lounge with custom-printed fixtures. Sponsoring additional areas gives your brand an edge over thousands of other exhibitors, and will peak the interest of visitors, drawing them to your booth. You may also choose to equip your staff with backpack banners to walk around the venue market your exhibit to attendees. 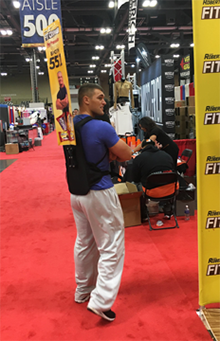 Backpack banners come in many eye-catching shapes and sizes (including butterfly wings) that will help your event staff stand out on the exhibit floor. On the banner, print your brand's messaging and booth location, and you may find many curious visitors coming to your way. After you have reserved your booth space and set it up, it is important to give event-goers the incentive to come visit. Free giveaways are a very popular tactic, but you'll want to think outside the box because items like keychains and bookmarks often get tossed out shortly after events. Your company will be much better off by giving away products that people can't help but use. For example, consider handing out USB sticks with your company logo printed on them. Many companies go the extra mile by placing promotional and contact information onto the drive. 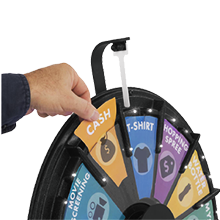 Trade show games, such as prize wheels and prize drop games, are a fun and highly effective way to draw visitors and have them participate. These unique games create interaction and help humanize your company. 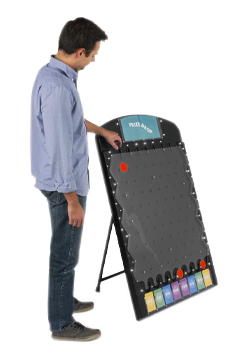 Trade show gaming equipment is usually designed with easy transport in mind. Many of these games can be customized either before hand or on the fly, which will give your company a definite edge on the competition. 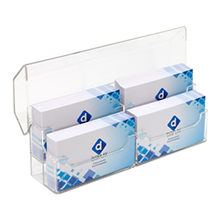 If you run out of a certain promotional item, simply switch out the prize card with another or erase the panel and write in another prize to keep the show going. Some prize wheels come with built-in LED lights that allow company representatives to capture the attention of viewers from further away, even if they are in a competitor’s stall! Again, make sure that all your prizes and games are well branded with your company name and slogan to maximize your exposure. Creating engaging and relevant content for your company's social media channels will also help to connect your brand with potential customers and clients prior to a show. Be sure to not only advertise any upcoming events to attract more attendees but also to interact with people through these channels on the day of the show. Consider posting FAQs, customer comments, and even pictures taken of promotional giveaway winners to interact with people even after the event has concluded. There is no doubt that social media types love to see pictures of themselves and share their experiences with their friends, which will help your company stay relevant while reaching an even larger audience. Twitter is a very popular tool for trade shows and other conference events. Many trade show sponsors create hashtags specifically for each event. Be sure to utilize these hashtags to your advantage by posting interesting content using your company handle. Once you set up your booth, post a photo on social media with the booth's location to invite people to visit. You can also use social media channels to network with other businesses if they provide products or services you need. Think about your company's strategy when selecting the proper social media channels, as some may be more conducive to certain industries than others. The reason for attending a trade show or having an event is to grow your brand and expand your customer base, so remember to collect as much customer information as possible. In the age of technology it is important to have not only a phone number and email but also social media contact information for promotional advertising. It is also important to build your brand and network in real time with prize giveaways and print marketing handouts. Most importantly, have fun! Everyone loves fun, including potential customers, so make sure they are excited and having a good time.